I live close to the Caltrain right-of-way, so cab cars like this one are a familiar sight. I certainly saw plenty of them during the filming of Caltrain 2005! Athearn’s Bombardier cars are nice models, but they lack any operational lights. On the DVD I show how I installed a Digitrax SFX0416 sound and light decoder to make the headlights, ditch lights, and reverse lights operational, plus additional LEDs to light up the interior. The car now has a horn and bell, too, just like the real thing! 1 (address) 117 This is the cab car’s address. 117 counts as a 2-digit address since it is less than 128. 60 (sound scheme) 1 1 is the diesel sound scheme, including an air horn. 0 is steam, kind of amusing in a cab car but not really what I was after. 62 (ditch lights) 3 Ditch light flash rate. 63 (ditch lights) 55 Ditch light holdover time (how long they flash after the F2 key is released). 140 (volume) 1 This is the prime mover sound volume. Cab cars have no prime mover, of course, so I wanted to turn this off. For some reason 0 did not disable the noise in my decoder so I set it to 1 instead. 141 (volume) 36 This is the bell sound volume. 143 (volume) 1 This is the time-scattered air effects sound volume. For some reason 0 did not disable the noise in my decoder so I set it to 1 instead. 143 (volume) 1 This is the miscellaneous sound volume. For some reason 0 did not disable the noises in my decoder so I set it to 1 instead. 148 (compressor run rate) 60 This does nothing since the compressor sound is disabled. See CV149. 149 (compressor time) 0 This is the air compressor on time. 0 disables it. 155 (notching mode) 2 2 enables manual notching. In a cab car this doesn’t really do anything since the prime mover noise is muted (or nearly so). 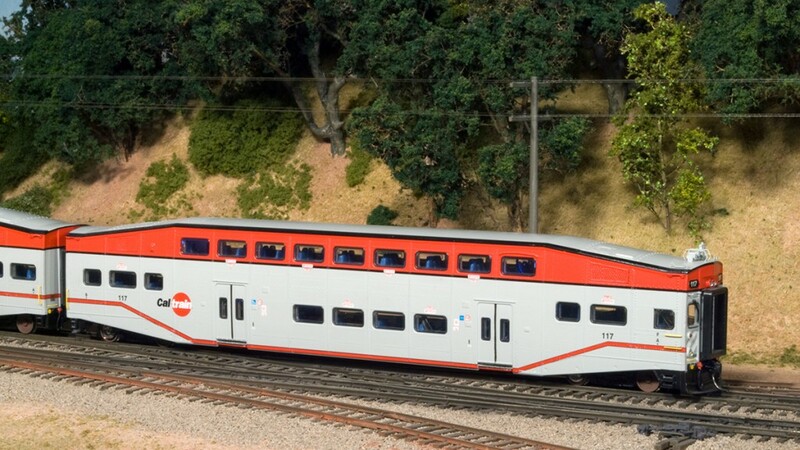 A few small details are not quite correct for Caltrain, but overall this car captures the look of the full-sized Bombardier cars. Adding electrical pickup to the wheels also added some rolling resistance, though this probably won’t matter since a typical “Baby Bullet” train is usually around 5 cars. These things are a little difficult to get on the track because of the truck design. There are no sideframes to grab, and the wheels are recessed under the car, so it can be hard to straighten them if any of the wheels are off the rails. Kadee couplers also require a bit of fiddling to get them to come out straight and at the proper height in the stock coupler boxes. Overall, though, these are nice cars. The SFX0416 has no provision for motor control. It is strictly a sound and light decoder, perfect in this case. 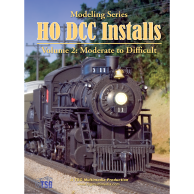 You can also use one of these to add sound to a locomotive with a non-sound DCC decoder. Like all Digitrax decoders, it supports decoder lock to make it easier to program in dual-decoder installations. The preloaded sounds seem to be the same ones that come with the Digitrax SoundBug decoder. These are generic steam and diesel sounds, but the decoder is supposed to be reprogrammable with new sound sets.